"This is not a time to slam on the brakes," Marshall said, describing the budget as a strategy to steer the province through to more financially secure times. "It's about momentum; it's about keeping the momentum going," he told reporters before unveiling the budget in the house of assembly. "We must maintain the momentum here at home and continue to invest to provide jobs and opportunities for the people of our province." The m-word crept into the Thrown-Together Speech, into the budget speech itself, and into at least four of the attendant Budgetosity 2010 press releases. And sure, just like many of the funding announcements, even the "momentum" theme is recycled. But there is a kernal of truth in the drive by the finance minister, whoever that is, to fetishize momentum. Herewith, some incontrovertible statistical proof of something economicky that actually has momentum behind it. 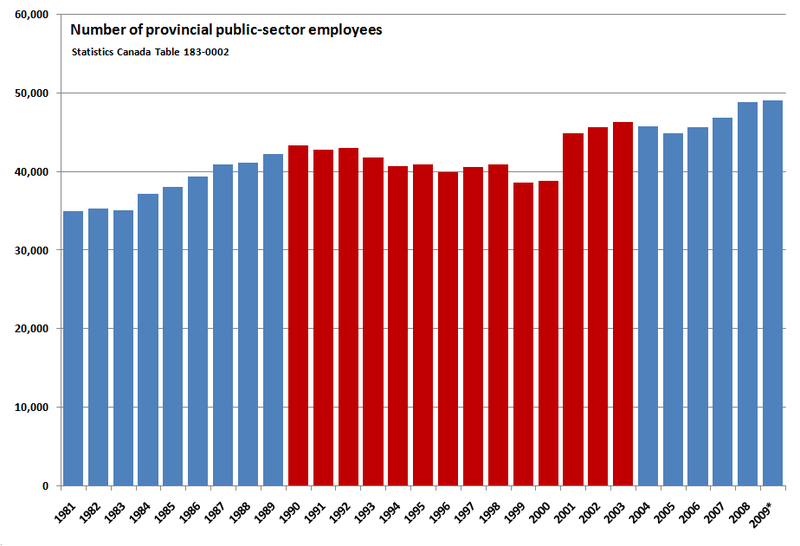 For the purposes of this, and subsequent charts, "provincial public sector" is taken to be the sum of employment in the provincial general government (i.e., the civil service); provincial health and social service institutions; (public) universities, colleges, trade and vocational institutions; and school boards. * Caveat: the figures for 2009 in this, and subsequent charts are preliminary.